Greetings from this One-Year-Older Blogger! I’ve also been a slacker, because like any good con-artist, I’ve managed to stretch my birthday celebrations out for two whole weeks. I haven’t had to cook much beyond the easiest of meals (read: breakfast for dinner, broccoli-stuffed baked potatoes, black bean chili) and it’s been a nice little break. I’ve also been treated to some excellent meals out at restaurants I wouldn’t normally visit, and while I’ve loved every minute of it, my jeans tell me that it’s time to get back to a more normal–and vegetable-centered–routine. So long, tandoori lamb chops and chocolate mousse! It was good while it lasted. Time to dig out the soup pot again. 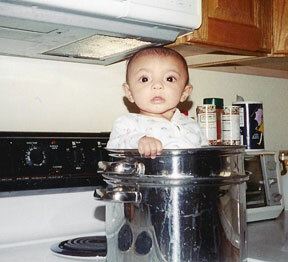 Another reason I haven’t been cooking? My husband’s been out of town a lot lately, and I become the culinary equivalent of a tortoise when left to my own devices. It’s a little embarrassing what I’ll call “dinner” when my husband’s in absentia. It’s usually something requiring the barest effort and the least amount of dishes, because who wants to do more dishes than they have to? I don’t hate washing dishes as much as say, scrubbing toilets or ironing dress shirts, but it’s still not my favorite activity on the planet. That’s why this recipe I’m sharing today is so genius, because not only is it fast, healthy-ish and tasty, it only dirties one skillet (or sheet pan, depending on your preference). I’d say that’s a recipe worth keeping around. If you’re making this meal for 4 people, use a sheet pan. If you’re making it for 1-2 people, use an oven-safe skillet (a heavy duty one or a cast iron one). Even if you’re not partial to Brussels sprouts (like moi), I’d still encourage you to give this a try. I think Brussels sprouts are improved markedly when paired with bacon and a good balsamic glaze, and this recipe features both, to great effect. I really liked the kick that the red pepper flakes added to this dish, but if you’re sensitive to spice, feel free to leave them out. This recipe takes 30 minutes from start to finish, and most of it’s just oven time, giving you more minutes to spend on finer pursuits. 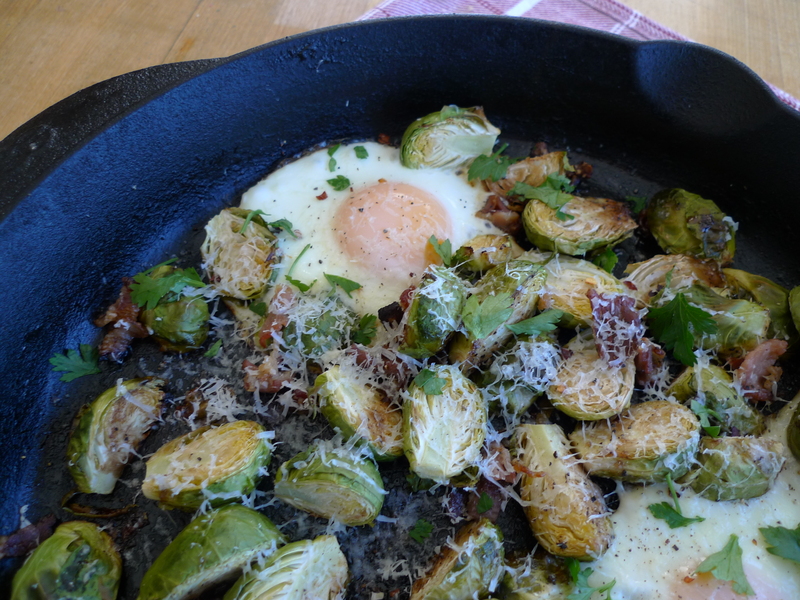 Once you add the eggs to the pan, keep an eye on it, as you don’t want overdone eggs. Unless you’re a freak and like them that way, of course. This makes a mighty fine dinner, served with some nice crusty bread, but it would be genius for brunch, too! Preheat oven to 400 degrees. Lightly coat a baking sheet with olive oil or cooking spray. In a small bowl, whisk together balsamic vinegar, honey, olive oil, Dijon mustard and garlic. Season with salt and pepper. 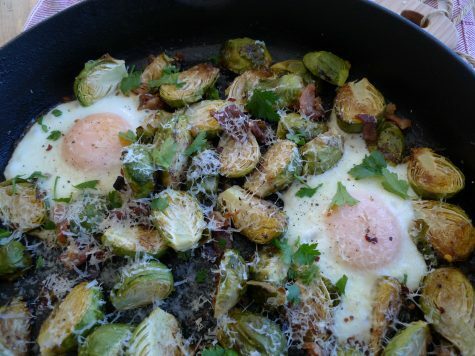 Place Brussels sprouts and bacon in a single layer on the prepared baking sheet. Drizzle balsamic mixture over and toss to coat, spreading it out in a single layer again after tossing. Bake in the oven for 1o-12 minutes or until becoming tender and a little charred. Remove from the oven and create 4 wells using the back of a spoon. Crack the eggs into the wells. Season pan again with salt and pepper and sprinkle with crushed red pepper and Parmesan. Place pan back in oven and cook for 5-9 minutes more, or until the egg whites have just set. Keep a close watch on them! Remove from oven and sprinkle with additional Parmesan (if desired) and chives or parsley. Ooh we all would love this! Anything with an egg on top and bacon wins my heart. And I think I am turning into a bear in my current life instead of a past one . I wasn’t a Brussels girl until I had them roasted with balsamic. Adding bacon certainly doesn’t hurt, now, does it? You could douse a shoe in bacon and balsamic and I’d eat it. Sorry you are feeling bear-ish, my friend. I get it. I honestly have no idea? Is it bad that I’d never even thought to eat the flowers? If you find out, please let me know. Chive flowers are beautiful additions to any dish in which you’re using the chives. Crush a few into biscuits, potato salad (sorry, Dana), etc. If these are in the same family, then they’d be used in the same way without issues. How great that you know this! Thank you!